If your dog greets you with a mouth full of slobber, it may be normal or it may be a sign of an underlying medical condition. Excessive drool, also known as ptyalism or hypersalivation, is an increased flow of saliva. If you have a dog with loose, pendulous lips, such as a mastiff, excessive drool is a normal sign. This excessive drool occurs because of facial structure and not because of increased saliva. However, in most dogs, excessive drool can be a reason to visit your vet. If your dog has a fear of thunderstorms or suffers from separation anxiety, you may notice increased drooling at these times. This is a normal response to fear. Other triggers for normal increased drool occur with food. Think about your favorite food for a moment. Did you notice an increase in your saliva production? Your dog responds the same way when he smells you barbecuing hot dogs and burgers. On the other side of the same coin, when you drop that lemon from the counter and he takes a bite, the sour taste may increase drooling. Conditions in the mouth often cause an increase in saliva. Conditions such as gum disease, oral ulcers or tumors, cuts and abscesses are often the culprit. Examine your dog’s mouth to look for signs of possible injury and, should you find something, consult with your veterinarian. It may be time for some doggie dental work. Stomach or digestive issues are another cause of increased drooling in dogs. A simple car trip may trigger motion sickness that can upset the stomach, causing drool that may even appear foamlike. Possible serious conditions include things like hiatal hernias, tumors in the esophagus, and gastric ulcers. If your dog tends to eat things he shouldn’t, a foreign object may have become lodged in his digestive system, resulting in excessive saliva production and drooling. If you have a dog that tends to nibble on things not intended for him to eat, toxins may be to blame for excessive drooling. Medications and certain plants, such as poinsettias, can be toxic to your dog, with one initial symptom being drooling. Spider or snake bites can do the same. 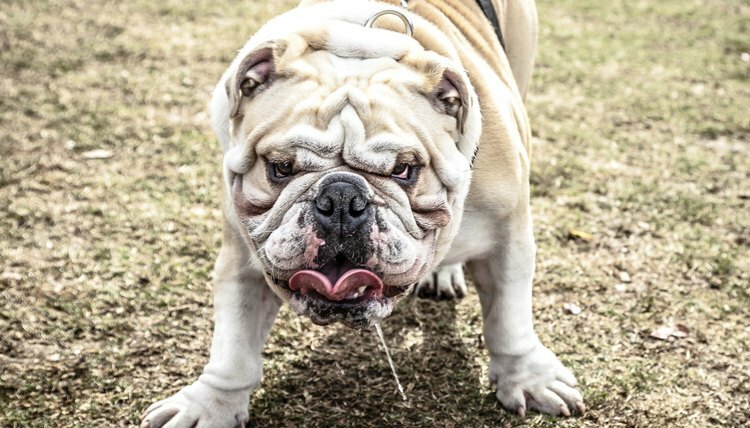 One serious condition associated with increased drool in dogs is rabies, in which the drool often appears frothy. If your dog gets into a fight with a wild animal, consult your veterinarian immediately. Make sure all vaccinations are up to date. Other possible causes of increased drooling include botulism, tetanus, neurologic conditions and seizures. If a slobbering mouth is not normal for your pooch, take him to the veterinarian for a full examination. While the drooling may turn out to be a simple irritation, it could also be a symptom of a much more serious underlying condition. AZVets.com: Why Is My Dog Drooling Excessively and Can I Stop It? Jacobson Veterinary Clinic: What Causes Excessive Salivation in Dogs and Cats? What Causes a Dog to Have Thick Mucus? Why Are Dogs Allergic to Chocolate? What Is Stomach Rot in a Dog? What Does it Mean When a Horse Foams at the Mouth? Why Is My Dog Coughing and Vomiting?